Food Processors in the USA have always prided themselves on their excellent safety record, and rightly so. But with the threat of bioterrorism and the globalization of the food supply chain, food processors are now being faced with the challenge of maintaining much more rapidly accessible tracking and traceability records. The FDA FMSA (Food Modernization Safety Act) regulations now requires that food processors be able to rapidly trace back from contaminated finished goods to the raw materials used in their manufacture. Food processors are also required to be able to track where all contaminated materials are in their facilities and where they have been shipped to. Many food processors are now being required to demonstrate that they are compliant with the FMSA by obtaining SQFI certification. This requires that the food processors maintain materials tracking and traceability records for 2 years. They are also required to keep records that demonstrate that materials passed through appropriate quality control points and were appropriately labeled. Many organizations continue to maintain their lot tracking records manually. This can result in an inability to rapidly recall "one-step backward" and "one-step forward" traceability data when required. If a food processor cannot produce the data that clearly identifies the source of a problem and then identify individual lots or containers of material to be recalled, the FDA can now insist on a blanket recall. Such a recall recently cost Menu Foods over $32 Million dollars because they were not able to track the source of the contamination and then produce the data to limit the recall to just the contaminated materials. Food terrorism is a very serious problem due to substances such as Ricin. Ricin can be manufactured from castor beans using the equipment in a high school chemistry laboratory. Ingesting an amount the size of a pinhead can kill you, with no known cure, by breaking down the cell membranes in your body. A small vial, poured into a food mix batch by a terrorist worker whose background is not well known (possibly an illegal immigrant), could kill tens of thousands of people. In the face of threats like this it is imperative that food processors have the ability to instantly recall tracking and traceability data, so as not only be able to track materials but also the people that handled them. A BellHawk system enables organizations to use barcode, RFID and wireless mobility equipment to capture the tracking and traceability data needed for the FDA regulations. It can also enable food processors to quickly identify problems and thereby limit recalls and the ensuing cost of lawsuits. Most importantly, a BellHawk system will typically pay for itself in 6 months or less by improvements in operating efficiency that result from better tracking of operations. So, instead of paying the ongoing costs of maintaining manual tracking and traceability data, food processors can put in a system that will pay them money after the first six months. Food processors still maintaining their traceability records by hand, using pencil and paper and who want to switch over to electronic records. Food processors that want to add data capture capabilities to an existing ERP, financial or manufacturing control system. 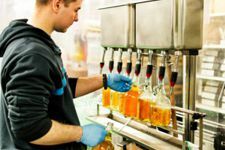 BellHawk is the ideal alternative to replacing your existing accounting system with an expensive integrated food processing ERP and manufacturing control system. Food processors who need integrated tracking from raw materials through production and the warehouse to shipping. BellHawk provides this capability. Food processors who run multiple geographically distributed manufacturing plants and distribution centers. Food processors that need a tracking and traceability data capture system tailored to the way they do business rather than having to adapt the business to the needs of a software package. Please click on the following link for more information about the BellHawk Materials Tracking and Traceability capabilities.